I Wear Plain Clothes and I Love it: *BRB - Pingsan dulu! after ordered a rawr wedges few months ago, I asked my lovely sist Rembulan Indira, who owns MoonAddict (former known as Rumah Sepatu Bulan) to made me this espadrilles wedges. I saw this model online, and after a long and hard chit-chat, she accepted my order! YAY! she would use batik as the material for this shoes, and I was so excited! and when I saw this picture on her site, whooooaaaaaa! I think I'm gonna lose consciousness. This is too beautiful! 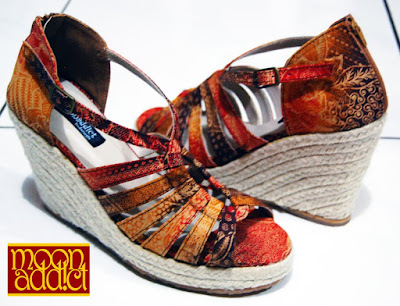 I will review more about this gorgeous wedges after this shoes arrived.